Camouflage, a battle scene and a tank make this combination unit fit for any soldier. 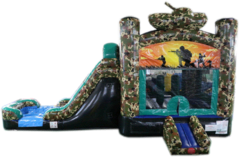 This bounce has a large bounce, a climbing wall and a slide to help your little soldier train and have fun. This bounce is a great addition to any military themed event. The large mesh viewing keep everyone safe and the fun going on.